This private, gated community features traditional homes with Old World-inspired exteriors ranging in size from 3,300-4,700 square feet. The seven floor plans include a guest suite on the main floor with options on some plans for upstairs and downstairs owner's retreats or a second owner’s suite. These homes offer four to six bedrooms, three to six full baths, two-car garages and optional basements. The new model home is expected to be ready for tours in July. The model home, The Richwood, will be a two-story with 4,337 square feet of living spaces, not including the basement. This home will feature five bedrooms, including two Owner’s Retreats, media room, study, dining area, two-story family room, guest suite on main floor and covered porch with outdoor fireplace. The Reserve at Old Atlanta is situated on 105 acres and offers homebuyers many amenities, including junior Olympic swimming pool, clubhouse, tennis courts, playground and walking trails and 36 acres of open spaces. Students in The Reserve at Old Atlanta attend acclaimed Forsyth County School District. 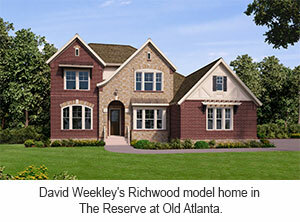 For more information about homes in The Reserve at Old Atlanta, call 404-481-3907.